Robert Waag, professor emeritus of electrical and computer engineering, receives the Hajim School Lifetime Achievement Award from Dean Wendi Heinzelman. "Using ultrasound to look through tissue is like looking through the irregular glass of a shower door," Professor Robert Waag said in 1995 when he was named the Arthur Gould Yates Professor of Engineering at the University of Rochester. "The glass distorts light waves, so shapes behind it are changed." During 46 years of research at the University of Rochester, Waag has tackled the challenge consummately well, improving the resolution and clarity of ultrasonic images, and earning international recognition for his pioneering research in medical imaging, biomedical ultrasound and acoustics. 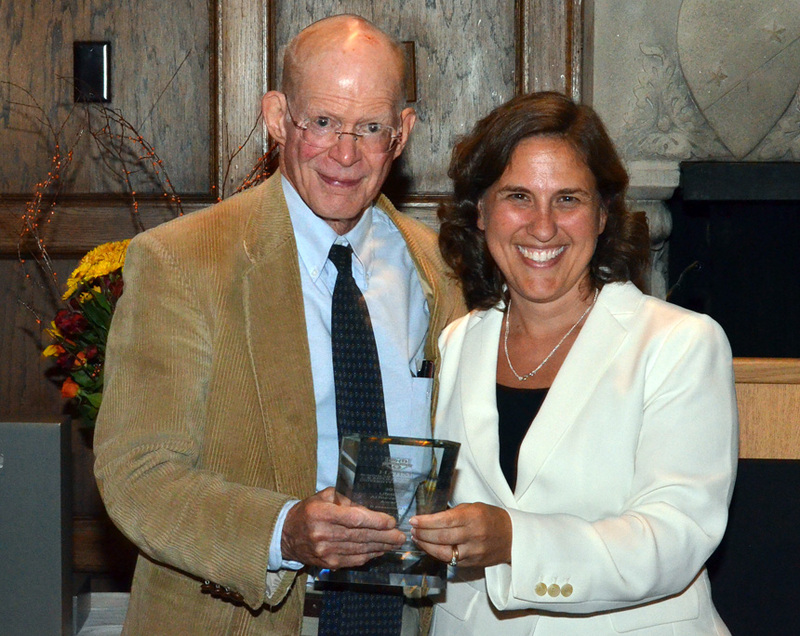 In honor of his achievements, Waag was presented with the Hajim School’s 2016 Lifetime Achievement Award at the school’s annual reception at Oak Hill County Club. Waag, who received his PhD degree in communications engineering from Cornell University in 1965, was a member of the technical staff at Sandia Laboratories, and then served as an officer in the U.S. Air Force at Griffiss Air Force Base, before joining the faculty of the University of Rochester in 1969. During his early years at the University, Waag was introduced to the field of diagnostic ultrasound, working alongside Ed Carstensen, the first director of the Center for Biomedical Ultrasound, and radiologist Raymond Gramiak, with whom he coedited Cardiac Ultrasound (1975), one of the earliest ultrasound textbooks. create powerful computational tools to clean up and analyze ultrasonic images. Moreover, long before terms like “translational” and “bench-to-bedside” became the buzzwords they are today, Waag worked hard to make sure his pioneering advances were getting into clinics where they could help doctors and patients. Waag received the Joseph H. Holmes Pioneer Award from the American Institute of Ultrasound in Medicine in 1992. He is a fellow of the Acoustical Society of America and the American Institute of Ultrasound in Medicine. In 2014, the journal Ultrasound in Medicine and Biology published a special festschrift in honor of Waag’s legacy. In the introduction, Frederick Kremkau (’72 PhD), Professor of Radiologic Sciences at Wake Forest, lauded Waag’s “seminal contributions” at the “leading edge of research in medical ultrasound . .. . opening paths that are original, independent, and mathematically advanced. “This (Lifetime Achievement Award) is something I can’t accept without acknowledging the colleagues with whom I’ve worked, including deans, department chairs, the staff I have interacted with over many years, and many students,” Waag said. He especially singled out his current lab members Jeffrey Astheimer, Jason Tillett, and Andrew Hesford.